Pinelands Trail | Florida Hikes! One of my favorite nature trails, the Pinelands Trail is a showcase for South Florida’s weird and wonderful karst, a limestone bedrock that’s full of Swiss-cheese like holes, crevices, pits, and tiny caves. 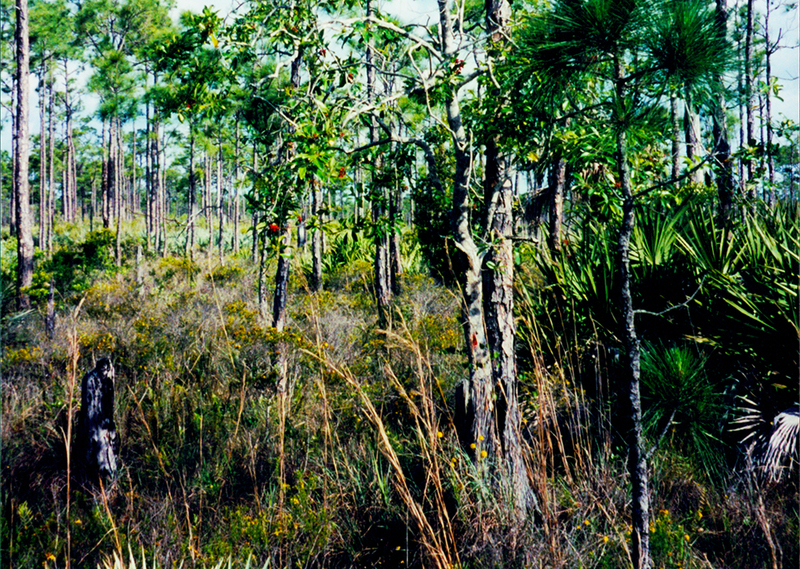 Pine rocklands are one of the rarest remaining habitats in Florida, and this is an excellent example atop a high point on Long Pine Key, a large rocky island surrounded by the River of Grass. 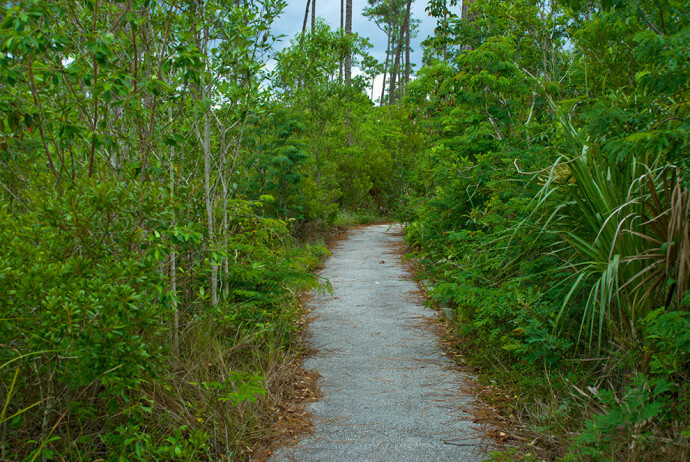 It’s a short, easy walk – paved and wheelchair accessible – introducing you to the pine rocklands and small patches of tropical forest where another rare treat, liguus tree snails, can be seen on the smooth-barked tropical trees like Jamaican dogwood and gumbo limbo. 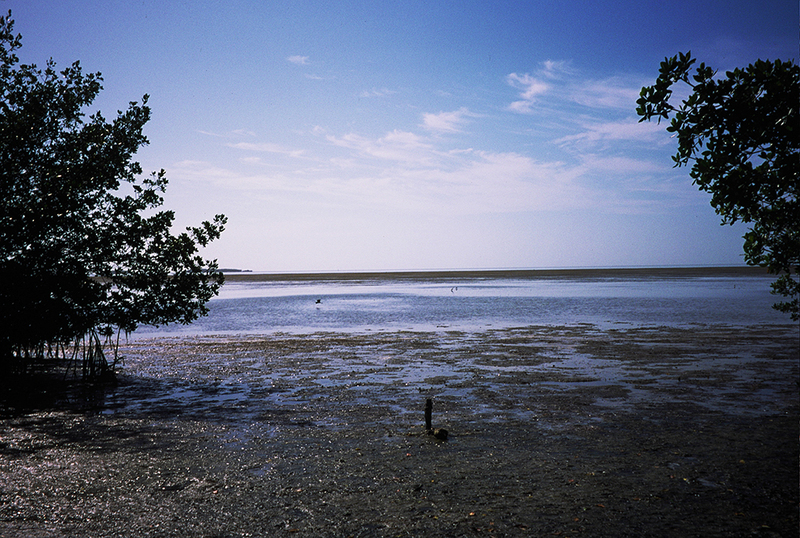 Less than a half-mile long, it’s a must-stop on any trip into the Everglades. This is a relatively shady trail for Everglades National Park, and less likely to be inundated with mosquitoes due to being in an upland area. The footpath is paved. Please be cautious if you step off the footpath, since the ground is full of jagged, rough-edged water-filled holes. Take Florida’s Turnpike south from Miami to where it ends in Florida City. Follow the signs along CR 9336 west for 8.6 miles to the park entrance. 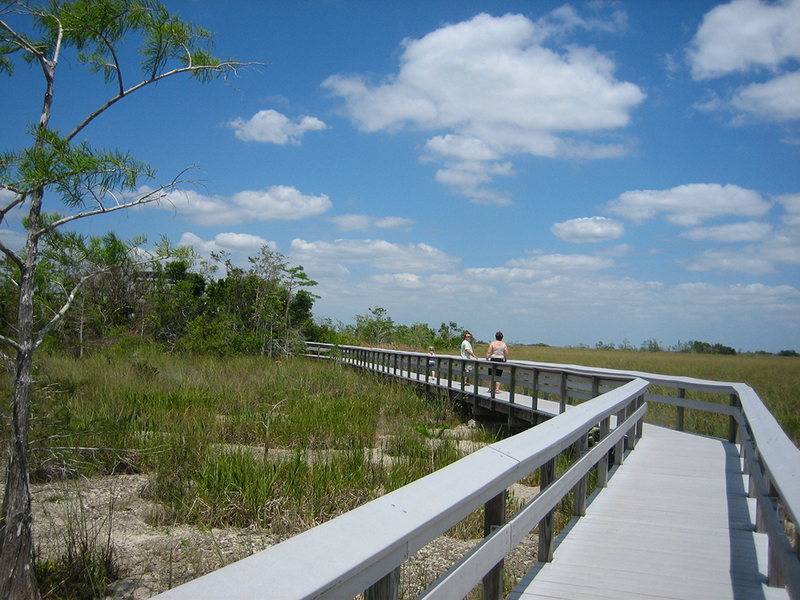 Continue along the Main Park Road, passing the entrance to Royal Palm Hammock and Long Pine Key Campground before you reach the parking area on the right, 7 miles into the park. The Pine Land loop trail immerses you in the tiny wonders of the pine rocklands, one of the most imperiled habitats in the world. 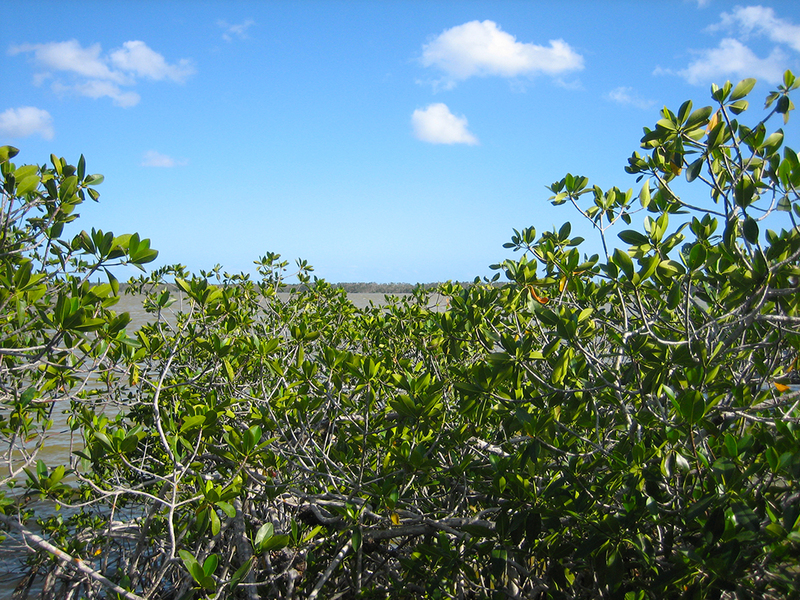 Pine rocklands are only found in South Florida, the Florida Keys, and some of the islands of the Bahamas. A rain shelter with interpretive information sits just beyond the trailhead. 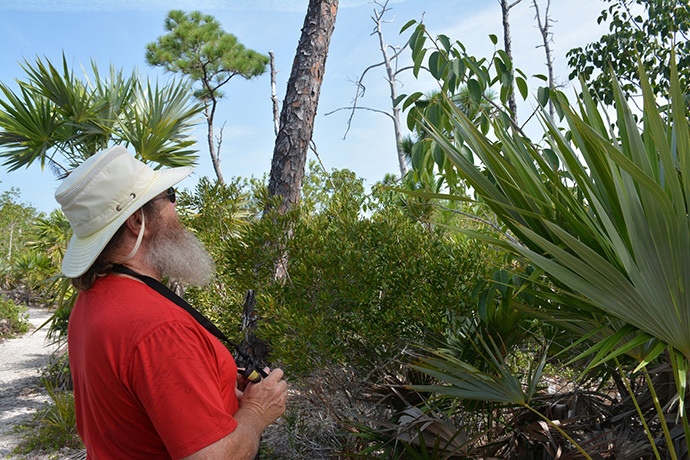 Take a moment to read about the role of fire in the habitat, and the effect of Hurricane Andrew on this forest more than a decade ago. Turn right to walk the loop counter-clockwise. Scrawny-looking pines flank you on both sides. The sturdy, skinny Dade County pines were prized by early settlers for their resistance to insects and rot. Clearing lands for agriculture and development throughout the Miami area meant dynamiting the delicate but thick karst bedrock. Look down and into this landscape to see nature’s lacy sculptures in stone, including deep, narrow pits and interconnected pipes. Most are hidden under vegetation and tufts of grass. When the forest gets a bit thick, you’re surrounded by a thicket of tropical trees clustered around some larger oolite holes. Look up. 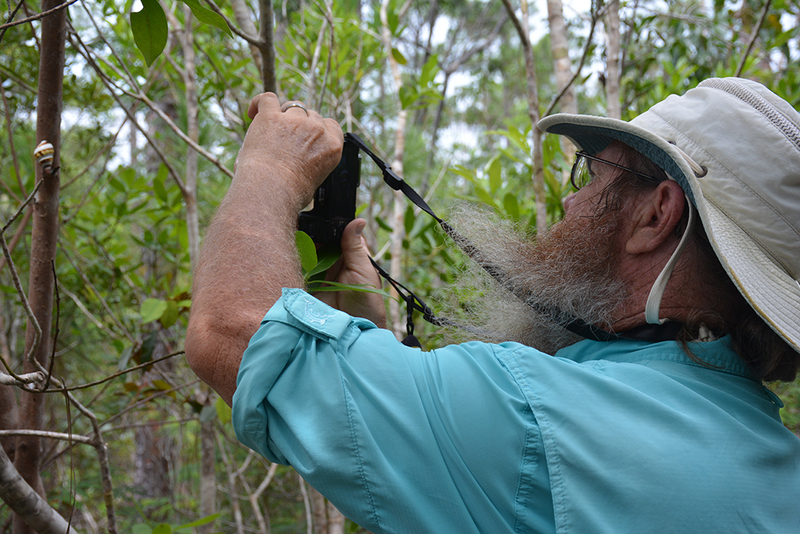 A careful inspection of smooth-barked tree trunks will yield some of the Everglades’ rarest inhabitants, the liguus tree snails. These delicate creatures feed on algae and fungus, and are most likely to be seen after a heavy rain. Like snowflakes, no two are alike. Notice the slender trees with lime-green tipped leaves and peeling bark in black and orange? It’s wise to keep your distance from these. They’re poisonwood, with sap ten times more toxic than poison ivy. You’ll see a lot of it growing along disturbed roadsides along the Main Park Road. It’s one of several poisonous Caribbean trees that are part of the native tropical forest. When in doubt, don’t touch the trees here, and don’t eat fruit you see hanging from the trees! The trail loops around through the tropical forest and opens up again, meandering its way through the pines once more. The view off to your right goes on for some ways through the understory. Look for more deep holes hidden along the edges of the trail. You return to the rain shelter after 0.4 mile.